The Shroud of Turin remains one of the most curious of all religious artifacts, with a faint image of a man many believe to be the body of the crucified Jesus Christ. “The Shroud is the single-most studied artifact in the history of humanity,” said Richard Orareo, who developed the collection over more than 40 years of searching. He hopes to open the shrine in May. 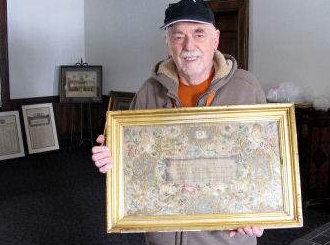 Orareo, a Boston-area native and resident until his recent move to Wabash, said his items form the largest Shroud-related collection in the United States. He said the collection probably ranks as the third largest in the world behind the collections of the Museum of the Holy Shroud in Turin, Italy, and the House of Savoy — the former Italian royal family — in Switzerland. The Shroud was held for centuries by the House of Savoy, Orareo said. It was willed to the Catholic Church when the last king died in exile in the 1980s. It now is housed at the Cathedral of St. John the Baptist in Turin, Italy, but rarely goes on display. Scientists and others have debated for decades whether the Shroud contains images of the front and back of Jesus' body after his crucifixion, which Christians will commemorate on Good Friday. So far, testing has not proved or disproved it. Orareo, 75, became interested in the Shroud as a young adult in his late 20s or early 30s. Raised Catholic and of Italian heritage, he happened to see a television show on the Shroud of Turin one day while at home. At the end of the program, viewers were invited to send in a self-addressed, stamped envelope if they wanted to receive a photo of the Shroud. Orareo did, and when the photo arrived, the envelope also contained a list of a few books that offered more information about the Shroud. Orareo then set out to collect books and other information about the Shroud, as well as artwork that depicts it. He purchased his first piece of Shroud art for $75 in an antique store within a quarter-mile of his home. Over the next four decades, he has taken many trips to Europe to buy Shroud-related items... he said. The collection ... will include more than 1,000 books, journals, periodicals and documents, he said. He has more than 100 framed pieces of art and a few relics, including a tiny fragment of the Shroud. Orareo would say only that he has invested “a lot” financially in the project. ... He believes many visitors will leave inspired in their faith.